导管内癌高倍放大图。肿瘤细胞位于导管上皮内且没有穿透基底膜至间质。值得注意的是中央处两个大的小叶包含了小钙化灶。这种钙化在乳腺X射线造影术下可见。 This high power microscopic view demonstrates intraductal carcinoma. 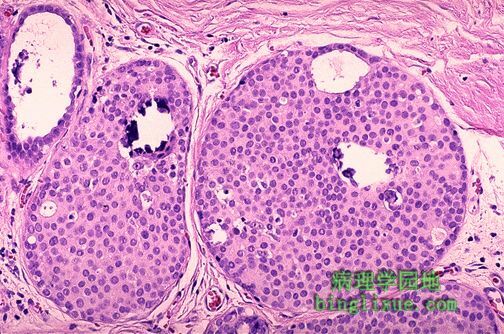 Neoplastic cells are still within the ductules and have not broken through into the stroma. Note that the two large lobules in the center contain microcalcifications. Such microcalcifications can appear on mammography.